If ever there were a character deserving of an ongoing series, it would have to be Faith Herbert. 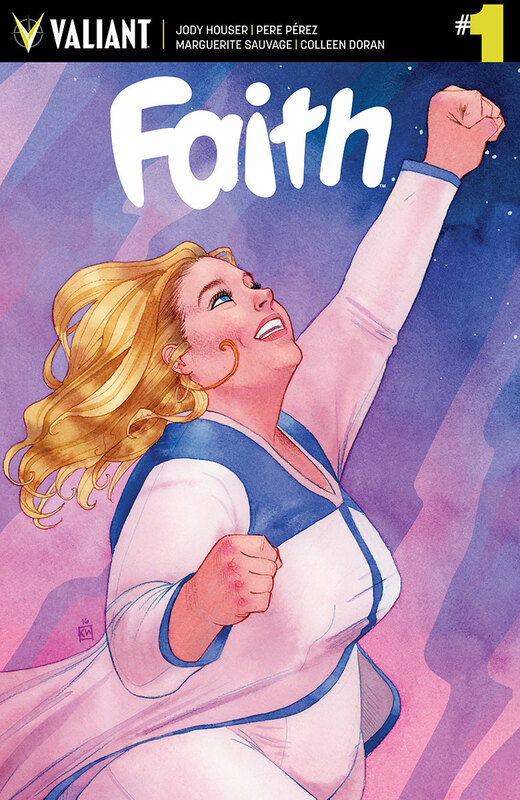 After her critically acclaimed early appearances led to a critically acclaimed four-part miniseries, Faith is finally stepping into her very own ongoing series. A series that – if this first issue is anything to go by – is headed for yet more richly deserved critical acclaim. Jody Houser continues her confident, humorous and engaging writing of the character, and while the real meat of the story takes a little longer to get going this time around, the fact that we’re dealing with an ongoing series rather than a limited run affords a certain relaxed approach to the pace. Once again the story features the same blend of humour, drama and geeky pop culture references, including the likes of Spider-Man, Douglas Adams and Star Wars (Phantom Menace and Force Awakens, with different degrees of affection). It’s also worth mentioning that this is a pretty much perfect jumping-on point for the character, with Houser handling the “previously on Faith…” section with ease, providing a gradual introduction to our heroine’s life and all the trials and tribulations it involves. Faith has issues with her job, her secret identity, and relationship quandaries, not to mention a nagging doubt about the suitability of her costume. If this all sounds a little “young adult”, that’s not entirely unjustified, but as a bitterly cynical thirtysomething comic fan, I can heartily attest to the universal appeal of the story, with the infectious charm of the leading lady keeping the pages turning and my smile firmly in place throughout. Pere Perez’s artwork is a little looser than Francis Portela’s was in the four issue miniseries, which actually helps things to flow a little smoother here. It’s still every bit as expressive though, and the impressive aesthetic is buoyed considerably by Andrew Dalhouse’s typically bright, lively colours. For me though, it’s Marguerite Sauvage’s stunning “fantasy sequences” that really make the book pop, with her lusciously rendered anxiety dreams, romance novel-type imaginings and D&D-esque shenanigans providing a beautifully visual insight into Faith’s psyche. Once again, while it’s probably coming across like a broken record by this point, it’s worth noting how admirable it is that Faith’s ‘plus size’ aspect is only one small, almost inconsequential aspect of her character. While it’s fantastically inclusive to have a hero like her around, and I absolutely love the fact that comic fans with different body types can now have a hero that represents them, I’m also incredibly grateful that she isn’t being solely defined by that one characteristic. If you haven’t jumped on this particular bandwagon yet, now is the perfect time. Mixing superhero shenanigans with real life issues, and packed to the brim with humour, drama and excitement, Faith is all but guaranteed to become your new favourite superhero.